Back to allotment business today. We managed to spend some time on the plot this weekend getting as many of the small jobs done as possible to keep the next week free for fruit cage business. First off we finally planted out the Oca that had been getting a little pot-bound in the greenhouse. 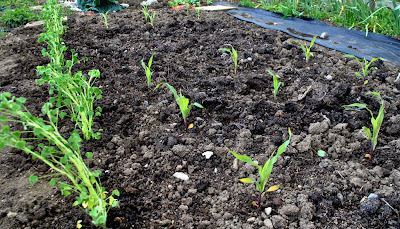 Here it is next to the sweetcorn we planted out last week. We also got the leeks in the ground. I'm never quite sure how people make the holes required for these, every year soil crumbles back into mine as soon as I remove the dibber thing I use to make them. Anyway, we managed, kinda, and they seem happy enough. Will have to remember to earth them up a bit this year to try and make them a bit longer. 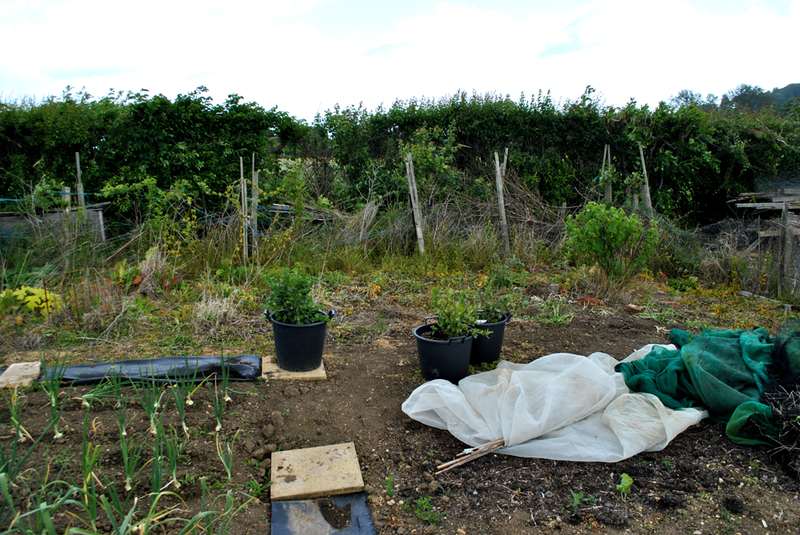 Next we gave the whole of the plot a good hoe and dug over most of the gaps in the brasica bed. 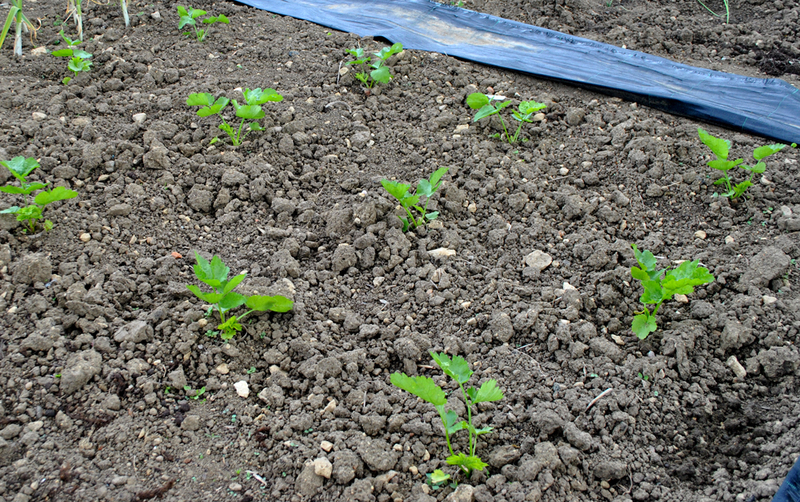 Here's the parsnips which seem to have settled in nicely after looking a bit weak and wobbly for a while after they went in the ground. Now it's time to knuckle down and get the fruit cage area sorted. There's a lot of ground to clear, the posts from the old netted tunnel removed and then the soil needs rotovating in preperation. As you can see it's a bit of a mess at the moment (and has been since we inherited the plot) so there's lots to do this week. I've sown parsnips direct for the first time this year and I'm surprised that they've germinated really well. Looks like it's all steam ahead now to get ready for the fruit cage. If the soil is very dry we water it well before making the holes for the leeks and this seems to stop th hole filling up too quickly with dry soil. Have you grown Sweetcorn before? is it difficult to keep? Don't work too hard. Slow and leisurely that's how to do it. 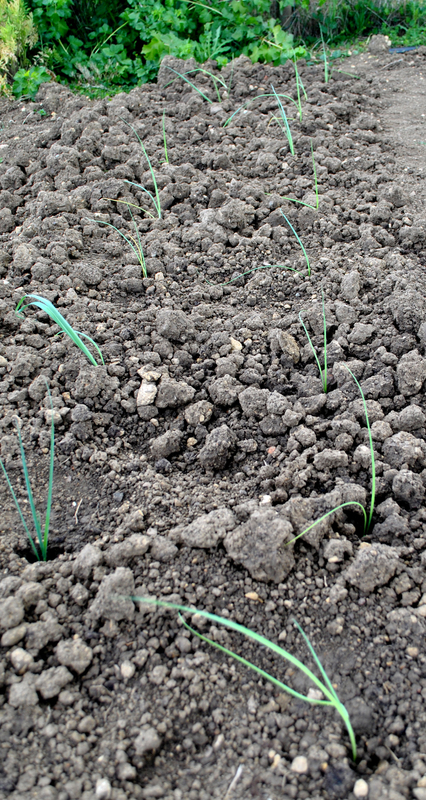 I use my hoe-handle to dib leek holes - I wet the soil first and use a bit of a twisting motion and it seems to help. Very jealous of the fruit cage plans - can't wait to see it all happen! 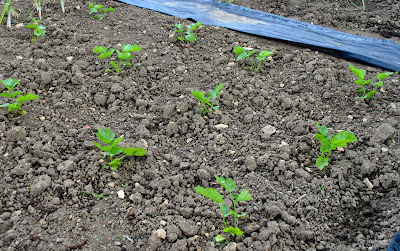 @ Jo - I think I'm going to chance some direct sown parsnips next year, along with my normal chitted ones, and see which does better. Things are looking really good. Keep up the hard wrok and your allotment will be ship-shape in no time.